Bunny love… the cutest little bunny looking at you… with pink ears, tiny paws, sitting in a basket, happy little flowers and eggs sprinkled all around. 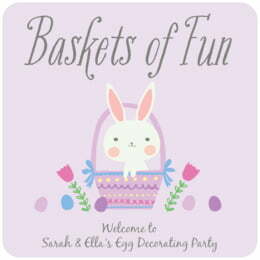 Bunny style has a little extra decoration as well, with little hand-drawn brightly colored stripes and dots. An adorable style for a special party or birthday! In your choice of four pretty spring colors that look terrific together - and if you want to order several items you can get each of the colors and have an especially beautiful event. 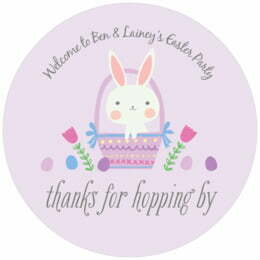 Customize your Bunny coasters today! Bunny coasters are made of extra-thick 58-point board. To give you an idea of how thick they are, a stack of a dozen coasters is about 3/4" tall. They are made of absorbent pulpboard to help protect your tabletop. The coaster surface has a smooth matte coating to provide beautiful, crisp printing. Each coaster is carefully die-cut in a letterpress, which gives the top edge its distinctive rounded shoulder. We use a digital 4-color, high-resolution press for fine detail and rich color. All of our personalized coasters are designed to match our labels, tags, and other products, so when you order multiple items, you get a matched set. On the back of each coaster, a small Evermine logo is debossed (pressed into the paper).